Through volunteer labor and donations of money and materials, Habitat builds simple, decent houses with the help of homeowner (partner) families. Habitat houses are then sold to partner families at no profit, through no-interest loans. The homeowners’ monthly mortgage payments go into a revolving Fund for Humanity that is used to build more houses. 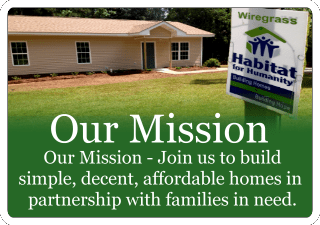 Habitat carries out its mission at the community level through organized groups called affiliates – Wiregrass Habitat for Humanity is one such affiliate. Habitat is not a giveaway program. In addition to a down payment and the monthly mortgage payments, homeowners invest 500 hours of their own labor – sweat equity – into building their house and the houses of others. Wiregrass Habitat for Humanity serves four counties. Wiregrass Habitat for Humanity has built 127 homes in the Wiregrass community. Twenty Wiregrass Habitat homes have been completely paid off! Currently it costs Wiregrass HFH about $50 per square foot to build a house. Homes built by Wiregrass HFH and sold to homeowners typically between $45,000 and $75,000. Wiregrass Habitat for Humanity is a partnership. We partner with the low-income families we build with. We partner with the businesses, churches and civic groups who donate the funds and building materials to build the homes. We partner with other service agencies to educate our partner families to be responsible homeowners and community-minded citizens. Wiregrass Habitat for Humanity builds more than houses. We build self-esteem in families by teaching them building and life skills that will make them better homeowners. The family is strengthened by pride of ownership. Homeownership breeds homeownership. Children benefit by a more stable homelife and the opportunity to stay in the same school. Families are selected for the Habitat Building Program based on 3 Criteria. NEED - Families must be currently residing in substandard housing. ABILITY TO PAY - Families must have a stable, verifiable income of at least $8650 to be considered. Credit and income-to-debt ratios are checked and verified. A $1500 down payment is required. 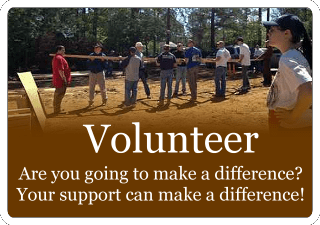 WILLINGNESS TO PARTNER - Every family selected is required to complete 500 volunteer hours in the Habitat program, 300 of which must be completed before construction will begin on their home. 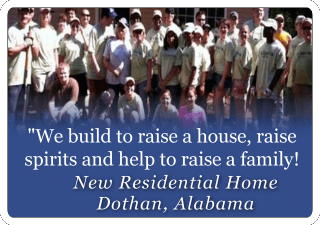 Property that Wiregrass HFH builds on is donated by individuals as well as our local city government. Currently, we have over 10 available sites on which to build.